Where the leaked doc is vague is where such science is usually vague, and that is on the time-frames associated with the real, and most likely detrimental changes to the earth’s climate. “…the natural variability of the Earth’s climate over periods of a few decades still makes it difficult to know exactly how global warming will play out in the short term,” Dr. Shepherd told the Globe and Mail. It’s really refreshing, I’m sitting in class at the National University of Singapore in my economics class and a girl in my class who already has her BA in economics is talking about overpopulation in a way that’s not economical at all — and she’s totally against it, even with the economic benefits. I love it. Anyways, she showed us a short video about the effects overpopulation will have on the world and it makes a good little lesson video. Take a look, if you’re interested. Quick Note: Sorry this post may seem a bit too long; that is because I planned it as such. It is difficult to make an effective rebuttal when certain parts of the initial argument are overlooked. So, liberals deny climate change? Now, Mr, Lowry, you are obviously a self-acclaimed conservative and it seems to me as if you are simply using climate change as a method of criticizing liberals. I will not go on to discussing the lack of ethics in politicizing science, which is what Mr. Lowry seems to be doing. Lowry goes on to discuss how although this data is confirmed, there was no increase in global temperature throughout the 21st century, going on to attack Barack Obama’s 2012 State of the Union address when President Obama urges Americans to reduce emissions. Lowry believes Obama did not mention “the latest trend in global warming”, no warming. So, Mr. Lowry may be the “denier” here. Let’s take a closer look at the data (Thank you Steve for all the great information). As mentioned, Lowry uses a The Economist article to support his argument; hence, the Economist information must itself be analyzed. The article uses a University of Reading chart as its main visual feature. First off, Mr. Lowry argues that ocean temperatures have not been rising? Our friends from SkepticalScience, although a biased source, do not agree. Now to answer Mr. Lowry’s comment on how “maybe clouds cool instead of warm the planet”. Clouds have a greater albedo than oceans and rain forests, so yes Rich, clouds do cool the Earth, but you would know that if you read the Economist article where this is explained. Well, it seems that Rich Lowry has been looking at the short-term consequences of global warming, not thinking about the intergenerational consequences that come with climate change. I do admit however, that there is one thing I and Mr. Lowry agree on. 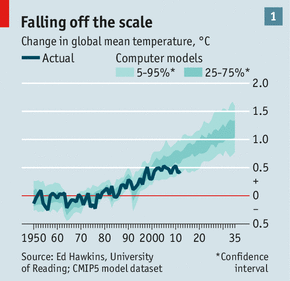 Uncertainty still dominates climate science, models are not exactly accurate and there is a lot to discuss, but regardless of this, global warming is happening.